Happy new year from Foxdale Fine Foods to you! 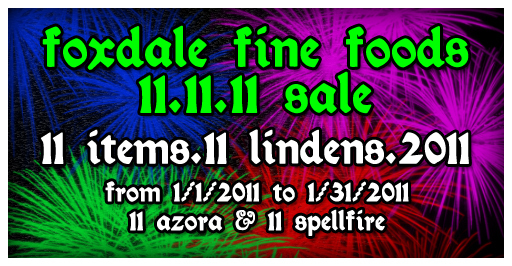 In celebration of the new year, we will be holding a sale. These will be available at my main store and on the SLM (if I can make it behave how I want) as soon as possible after midnight SLT. They will not be available through the vendors. Of course, as usual, all Azora products require an activation key.